George Chaconas displays a nice bonefish! World Record bonefish on fly caught by Vic Gaspeny with Capt. Richard Stanczyk. 14 lbs 6 oz. Legendary angler Stu Apte and Richard Stanczyk release a pair of bonefish! Even the kids catch 'em sometimes... if their really quiet! A younger Cecil Keith with a nice catch! Ronald Modra & Richard Stanczyk with another bone! Capt. 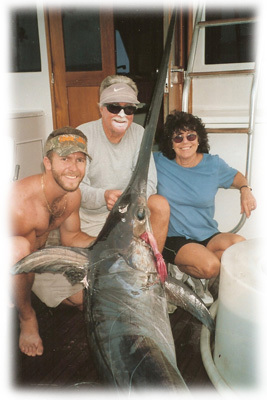 Richard with a female angler and a nice catch! Even Billy Broach catches a bonefish once in a while... lets hope this one lives! A little Mikey Mason wrestles a nice bonefish! Daryl Chronzy, the candian fishing phenom, and a nice bonefish with Richard Stanczyk! Dooles! Casey Dooley and a nice bonefish! Bringing bonefish back to life! Ricky Stanczyk helps bring this bonefish back into action! Our friend, sportswriter Steve Waters with his son Travis and his first bonefish! Thanks Capt. Richard! Our legal expert, Andy Horn, displays a beautiful bonefish! Richard Stanczyk, Bill Pickering, and Brian Cluck with a nice bonefish. Saved him for bait in those days! Aretina Rogers with a nice 'grey ghost' caught with Capt. Vic Gaspeny! Captain Jim Willcox and his angler Scott with a nice 14lb bonefish! Shirley Wilson, wife of Captain Ted, with a good bonefish catch! Richard Stanczyk & Vic Gaspeny with a HUGE redfish. Ones this size are rarely caught in South Florida! Ricky Stanczyk and a redfish! These kids show off a pair of redfish! Capt. Vic Gaspeny and Ron Modra display a lunker redfish!